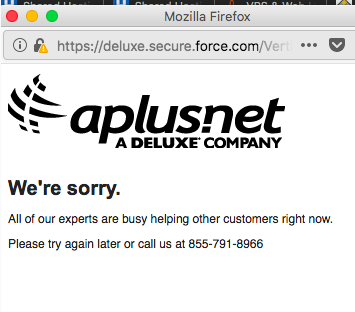 Aplus.net is a hosting provider with quite a controversial reputation on the Net. Based in Shoreview, MN, it has a long history, which dates back to 1993, full of records of being purchased and sold. Nowadays its owner is Deluxe Corp. The most important thing that makes you want to research more is the abundance of negative reviews in which users report a lot of issues, such as SSL problems, “terrible customer service”, unreliable uptime, switching control panels often, and other issues. Well, according to our data, however, this provider has much better performance than many and we can recommend it for a try. Currently, there are 3 shared plans on offer. They can only be purchased monthly, see the prices in the table above. Store and website creator as well as web design services, to name a few. The provider offers Linux-based low-cost hosting plans and services mostly for small businesses and individuals who want to build a website quite fast. That is why there is a comprehensive set of website-creation-related-services, including payment processing. Live chat wasn’t available when we tried, so, it is not 24/7 support. Phone support is available but only 9am – 9pm, ET (Monday – Friday). Tech support is allegedly available 24/7 via opening a support ticket. And there is a contact form. #19 and 8.6 HRank are the results for Aplus.net in 2018, and these are altogether very good results. Only thrice in the monitoring period, the provider’s uptime got lower than 100%, however, only as low as 99.635%. Though it wasn’t the fastest in terms of response time, it was close: 300-500ms. Very good, too. Interestingly enough, such good performance didn’t stop websites from leafing and the provider from losing domains. It is unclear why it happened.